Finding the right business partners is essential to executing growth strategy. There are many theories about how to expand a company. A lot of the science about metrics, budget, resources, cash flow, marketing, branding, etc, but the importance of selecting the right business partners to oversee expansion is too readily overlooked. You might have the best company in the world with the most robust systems and a market ravenous for product, but if the wrong people are given responsibility to run with it, failure follows. My own business is something of a case study. Having relocated to larger headquarters here in Sydney, New South Wales, many thought it would be a process of automation opening in Melbourne, Victoria. True, we had been steadily raising our profile in the area for a period of time, there are remarkable synergies between Melbourne and Sydney, and the construction market alone was extremely hungry for lifting equipment and expertise. But it took the availability of Ian Jongen, our state manager Victoria and a 30-year veteran of the industry, to see us over the line. And it’s not been a stroll in Melbourne Park, as we knew it wouldn’t be. Growing a business and opening new facilities is demanding. It would have been a huge mistake to proceed with another regional manager, even if the market did feel prime for a while. We’re not arrogant enough to think that the Ranger brand and its products could compensate for an average figurehead. We’ve seen many competitors make that error of judgement time after time. It’s a myth that a brand alone will open doors and people will buy from it based on a name, especially when they’re loyal to other, local suppliers. Here in Australia we’ve seen many perceived market leaders over the last 100 years, and they’ve all proved that big isn’t necessarily better. It’s one thing to open in every corner of a marketplace, but it doesn’t make that firm the right supplier for everyone in those regions. Great leaders can share their knowledge with the team they build and create a solution that’s not based on reputation or size, but simply on the right choice. A company should never be too big or too small. It should only be judged on its ability to meet a customer’s demands. But there are only a select few partners in any sector that can position a business accordingly. This article isn’t about Ian, but it’s worth highlighting the role he’s played to date. Key to his success has been an ability to answer any technical question that’s put to him, almost on the spot, which is fundamental to developing trust in a niche industry. We have always placed emphasis on strong technical knowhow—we underscore our business with the Service Through Knowledge tagline for a reason—and it’s not a mantra reserved for the few. Everyone, especially our regional partners, must ooze it from their pores. When Ian was under pressure, taking care of sales, admin, inspection, manufacturing, deliveries, etc., that commitment to being the go-to person for technical information never wavered. He always picked up the phone. He always delivered. You never really feel like you have ‘made it’ in business, but it always feels good to get beyond the initial start-up phase. 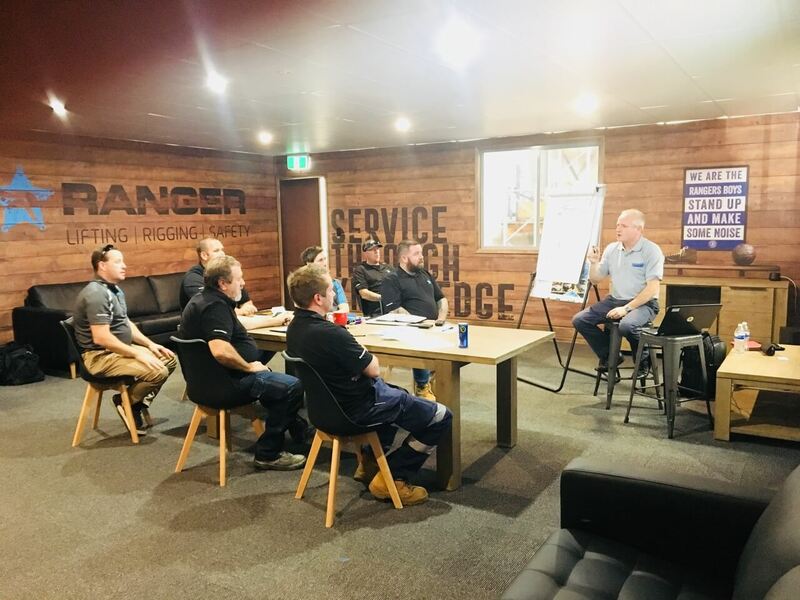 Now, Ian is part of a team of five, united in belief that Ranger will become the biggest and best lifting company in Victoria—it’s just a matter of time. That positivity is a hallmark of successful business partners. Nobody wants a negative influence on the end of the phone. Imagine how quickly the growth strategy would have unravelled if the initial challenges were met with a defeatist attitude. The business partners you want are the ones who say, “We can”. A can-do approach has to be measured, however. Over-promising and under-delivering can be disastrous for a start-up satellite facility. If you tell a new customer you can supply 100 wire rope slings by the following Monday, you’d better be there bright and early with the shipment. Once a business has a reputation for not doing what they say, the wheels start to loosen. Again, it’s important for the front-person to get the balance right. If something is going to be a challenge, they should be honest and perhaps ask for more time. What the specialist always has in their favour is just that—they specialise. The right product is going to be prescribed and it’s going to be backed up by proper expertise. People can bring generic business savvy to a company but it’s the sector-specific experience that separates the best from the rest. The highest performing partners are typically of the industry where they work. For us, only lifting industry professionals can lead a regional operation. The market is saturated with hardware and tool hire firms; we need to be different. We can’t successfully differentiate if our leaders offer only the same skillset as those we’re competing with. Our industry, for example, has changed over the last 20 years. Users now require items to be tagged, listed on a register, compliant, and backed by a team that knows the relevant standards. We’re mindful of the above guidance as we look to the hotbeds of lifting activity in Brisbane, the Gold Coast, South Australia, and North Queensland, to name just a few. Civil engineering and infrastructure sectors are looking set to provide long-term demand for rigging gear in many geographies but, again, it doesn’t matter how favourable the conditions appear if the next Ian Jongen isn’t ready to take the reins. We’re candid about plans to add a number of branches in the next five years, but that means finding as many people with longevity in the industry. This kind of partner doesn’t just fall off the shelf and land at your feet. It’s tempting to consider relocating the expertise that is at a company’s disposal, but it’s a dangerous strategy. Local knowledge is nearly always of paramount importance. There are general norms and trends but the leader of a new operation in, say, Brisbane, will ideally bring extensive experience from that city and its surrounding areas. The personal upheaval involved with relocation should be considered too. As Ian will testify, the start-up process erodes a lot of emotional capacity and not having an inbuilt support network of friends and family in place can see stress levels heighten. Finally, remember that price isn’t a shortcut to success, as good leaders realise. As Steve Thacker, our managing director, says, there are typically three key areas of focus on a contract: price, service, and safety. A contract department always look at price, managers look for on-time delivery, and occupational health and safety professionals look for safety. Typically, Steve adds, price wins on everything, until product is delayed and or a breakdown occurs. Then service wins. And it’s service that more businesses should build their offering around, especially when in growth mode.